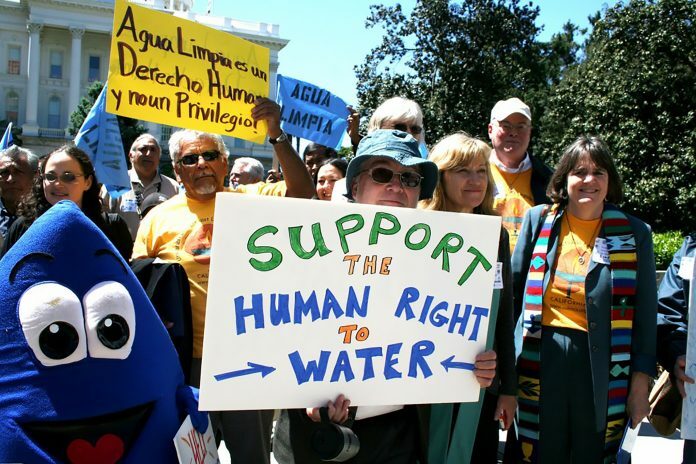 Why the right to water depends on sustained political will and follow-through. By James Workman. It is the birthplace of Apple and Google–companies worth nearly US$2 trillion–and this year overtook the UK to become the world’s fifth largest economy, yet nearly 2 percent of California’s residents suffer from the lack of safe, reliable and adequate access to water and sanitation. True, precise numbers are elusive (which reinforces the larger point of uncertain access). Yet one recent survey estimates a quarter of a million people in tribal and community service areas have no clean water. That’s equivalent to the entire population of Bhutan, Guyana or Cyprus. The number may be higher, if officials could assess countless local, small and domestic wells that have run dry or been contaminated. So what’s a sub-national government to do? That might sound innocuous enough. Yet Bill 1242 emerged in the second year of the Great Recession and the third year of a crippling drought. The state capital, Sacramento, grew mired in debt with heated debate over how or whether it could afford to overhaul management and infrastructure of the fresh water on which it depended. To be sure, no politician claimed to oppose water as a human right, per se. Yet the effort to codify it in a specific law raised uncomfortable questions: What would it cost taxpayers? Who would enforce it? Which office might be liable to prosecution in court for failure to uphold the right? How many litres would the right set aside? Did it overlap, extinguish, or interfere with other existing rights like irrigation, health and safety codes, or section 106 of the Water Code? Lacking clear answers, (Republican) Governor Schwarzenegger terminated the bill with his veto pen, arguing that only money, not unfunded mandates, could ensure affordable drinking water for all who lacked it. Almost exactly three years later – with economic recovery stirring – a new (Democratic) governor, Jerry Brown, signed into law Assembly Bill 685 to ensure affordable and universal access to safe clean water for “every human being,” then allocated resources to make it happen. The second attempt learned lessons from failure. From the start, this statute not only placed the human right to water at the centre of policy, but it also shows how agencies can guide and implement it by “revising, adopting, or establishing policies, regulations, and grant criteria” that impact water used for domestic purposes. Still, passing legislation is relatively simple and straightforward. What comes next matters more. A timeline by Circle of Blue shows that, while the initial law was a solid achievement, subsequent years proved equally important in giving it substance, direction, mass and meaning. For example, an early important step was for California to transfer oversight of safe drinking water systems from the public health agencies to the state water board. That anchored responsibility, resources and accountability under one roof. Later, under the Sustainable Groundwater Management Act, the human right to water formed one of the cornerstones to ensure roughly a million residential wells across the state would be protected or restored to functioning health with reliable access to clean, shared aquifers. In 2015 the Safe Drinking Water Plan reiterated the State’s commitment to the human right to water. A state-wide referendum, Proposition 1, authorized a US$7 billion bond for water projects, including – due to the human right to water – primary funds aimed at water provision to poor and disadvantaged communities. To ensure broad understanding, officials set up a human- right-to-water portal, providing data on drinking water systems that don’t comply with state and federal standards. The state recognised that people lack water due less to ignorance or intentional denial than to incapacity or institutional failure. So California set up a “sustainable water solutions office,” to provide technical assistance to communities that struggle to provide clean drinking water. Another law forced “chronically incapable water systems” to merge with their better functioning neighbours. Still a third prevented incompetent and poorly run water systems from forming. Three years into the law’s enactment, California’s Water Board was required to design a state-run residential water affordability program, again the first in the nation. Two years later it established a fund to assist poor communities with the operation and maintenance of water systems. It then established a tool to track implementation of the human right to water. Even under a booming economy, gains have been slow, hard to measure and few will declare victory soon, if ever. Yet California suggests both that pockets of unequal water access exist in even the richest economies, and that leadership and sustained will at sub-national levels can tip the scales in even the most divisive of polities.